Our eleventh annual Distinguished Visiting Speaker in Medieval Studies was Elizabeth Ewan, professor of Medieval and Early Modern Scottish History at the University of Guelph. With a PhD in History from the University of Edinburgh (1985), Ewan is an expert in medieval and early modern Scotland, focusing especially on urban history, women’s history, and the history of crime – all of which come together in her lecture: “Rough Justice: Life and Death in Medieval Edinburgh.” She is the author of several books, including Town Life in 14th-Century Scotland (1990) and Finding the Family in Medieval and Early Modern Scotland (2008), and over 20 papers published as book chapters or articles in academic journals. 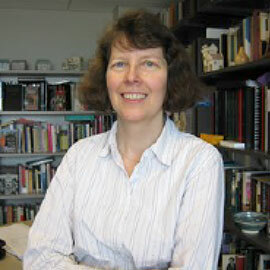 She has also developed an extensive scholarly website called Women in Scottish History (with the charming acronym WISH). Her research has received major funding support, including seven grants from the Social Science and Humanities Research Council of Canada. She has been a visiting fellow at Cambridge University, the National University of Australia, and the University of Edinburgh (twice). The recipient of two University of Guelph teaching awards, she is currently supervising seven PhD dissertations and two MA theses. Finally, Ewan has been named distinguished professor at the University of Guelph three times and is currently the university research professor. This year’s event, held on Jan. 20, was attended by a large audience comprising Laurier students, staff, faculty, and members of the general public, whose appreciation was demonstrated in a lively question and answer session at the end of her talk.